It is critical for media and entertainment companies that they get the most out of the content they’ve invested in. But for many monetization of their assets is being inhibited by slow and expensive tape-based archival solutions (LTO) as well as first generation cloud storage like Amazon. Wasabi Hot Cloud Storage, in partnership with Marquis Medway, is bringing media and entertainment companies a transformative new solution. Wasabi’s next generation cloud storage brings companies the speed they need to leverage their content, but costs far less than the traditional cloud storage options. Plus unlike Amazon and others, Wasabi does not charge you to retrieve your content—potentially a huge savings depending on how much you access it. 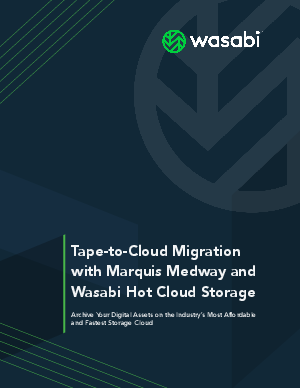 To help you quickly and efficiently get assets from tape to cloud Wasabi has combined with Marquis Medway’s advanced workflow automation platform. To learn more about how this integrated solution can help you rapidly transition away from resource draining LTO to Wasabi’s fast, affordable and dependable cloud storage, please download the whitepaper.